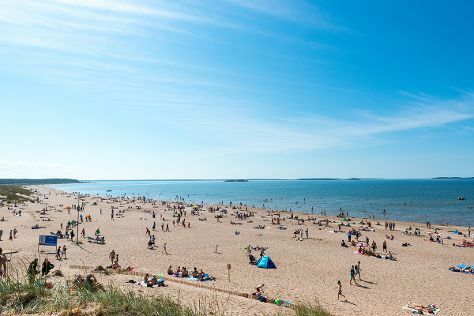 You'll get in some beach time at Yyteri Beach and Rauhaniemi Beach. Escape the urban bustle at Hatanpaa Arboretum and Ahtari Zoo. Go for a jaunt from Tampere to Pori to see Rakennuskulttuuritalo Toivo Ja Korsmanin Talo about 1h 45 min away. see Sarkanniemi Theme Park. There's still lots to do: take in the spiritual surroundings of Tampere Cathedral, see the interesting displays at Vapriikin Museokeskus, contemplate the long history of Amuri Museum of Workers' Housing, and test your problem-solving skills at popular escape rooms. To find photos, reviews, ratings, and more tourist information, refer to the Tampere visit planner. If you are flying in from United Kingdom, the closest major airport is Tampere-Pirkkala Airport. In February, plan for daily highs up to -1°C, and evening lows to -7°C. Finish up your sightseeing early on the 9th (Sat) so you can travel back home.